If you live in Vancouver or Victoria, drop by Ralph’s Radio to audition the latest Audison Prima subwoofer solutions. These compact subwoofer enclosures and shallow-mount drivers are designed to work hand-in-hand with Prima amplifiers and speakers as the perfect upgrade to your factory audio system. Audison offers five enclosure solutions and three raw drivers in the Prima series. The 10-inch APS 10 D and the eight-inch APS 8 D and APS 8 R subwoofers are designed to offer impressive bass performance with minimal mounting depth and enclosure volume requirements. The D-series drivers are optimized for extremely compact sealed enclosures with volumes as small as 0.26 cubic feet for the 8 and 0.35 cubic feet for the 10. In many applications, we can create a custom subwoofer enclosure that will fit behind or under a seat in a pickup truck or the spare tire well of a sedan or hatchback. The R series subwoofer is designed for vented enclosure applications and works in a 0.30-cubic-foot enclosure to enhance output in the 30- to 40-hertz region. 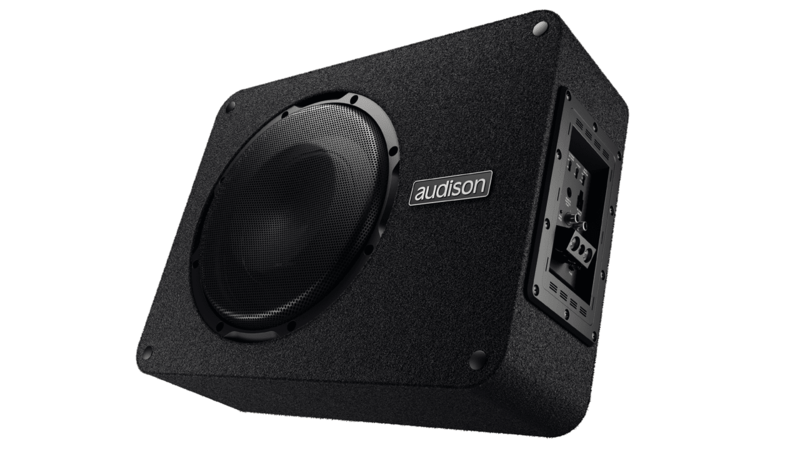 Audison offers each of the three subwoofers in an enclosure that is designed and engineered specifically for each driver. The APBX 8 DS is the smallest of the enclosures with a footprint of roughly 15 by 13 inches. Stepping up to the APBX 10 DS offers more system efficiency and output capability from an 18.6 by 13.15-inch space. The APBX 8 R includes a slot-loaded vent to increase efficiency and physical power handling while reducing distortion. Audison also offers eight- and 10-inch powered subwoofer system solutions using a unique amplifier and custom voice coil configuration. Rather than build an amp with a complicated and expensive power supply, the new he-li (high efficiency/low impedance) amp design drives the subwoofers directly from the battery connection. The target power level is determined by a custom low-impedance voice coil in the APBX 8 AS and APBX 10 AS applications. The amps have all the crossovers and level control adjustments we need to integrate these premium solutions into almost any vehicle. Audison also includes face-up and face-down mounting options for the enclosures that they call 2S2 or 2 Sides / 2 Sounds. Firing the subwoofer directly into the vehicle interior helps to emphasize midbass impact and detail. Flipping the sub over and directing the output towards the floor emphasizes low-frequency output. Adding a premium subwoofer to a factory audio system is the best way to improve the impact and realism of your listening experience. Drop by Ralph’s Radio in Vancouver or Victoria to audition the Audison Prima subwoofer systems. For more information, give our store nearest to you a call or send us an e-mail using our contact page.